A critical situation is developing in Naso territory, Bocas del Toro province, Panama. Some 50 Naso protesters are blockading the access road to the Boynic hydroelectric project, preventing workers from entering the construction site of the 30 megawatt dam, which is scheduled for completion later this year. The protesters are demanding the government ratify an agreement that was made two weeks ago, on Aug. 14, 2013. 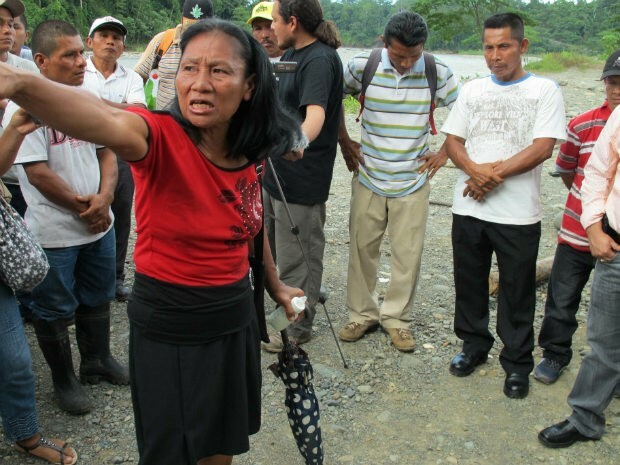 According to Panama’s national newspaper La Prensa, attendees at the meeting, held in the Naso capital, Sieiyik, discussed issues such as the right to a comarca (a semi-autonomous region), future hydroelectric projects in the area, and current projects the king has negotiated without community consultation. A resolution came out of the meeting, calling for King Alexis Santana to renounce the throne, new elections to be held, and the revocation of compensation agreements made with Empresas Públicas de Medellín (EPM), the Colombian company constructing the project. The King was told he had 48 hours to leave the royal palace in Sieiyik, and the meeting turned violent when one of the attendees, Luis Gamarra, was attacked by the spokesman of the board of the king, Adolfo Peterson. Although notified, neither national nor local government officials attended the meeting. The road closure is indefinite say protesters, who insist that the agreement must be ratified by the government. They are now waiting for the Minister of Government, Jorge Ricardo Fabrega, to meet with them. In a statement announced over the weekend, EPM said the blockade is affecting 3 thousand families who benefit from the project. Elizabeth Sanchez, a local leader, told La Prensa she is unhappy that a small group of people are threatening a workforce of some 600 Naso. The project has been controversial since its inception. In 2005, the Inter-American Development Bank (IADB) decided against funding the project after considering the environmental and social impacts. A year later, the Naso made international news when the former king, Tito Santana, made a deal with EPM to build the dam on the Bon River in the heart of Naso territory. Tito divided the nation of some 3000 people when he failed to consult with them. Tito was exiled to the nearby town of El Silencio and his uncle, Valetin, replaced him as king. The government refused to recognize the staunchly anti-dam Valetin and in 2011, another election took place and Alexis Santana, who also opposed hydroelectric projects, was voted in. In September 2012, protests erupted and the road closed. Several Naso were dismayed at the destructive way in which EPM was proceeding. Others were fed up of waiting for promised compensations. Faith in the new king began to wane. The Naso are one of the few indigenous groups in the Americas that continue to have a monarchy, and this small nation, which is spread across 11 riverside communities, has relied upon and protected the surrounding rainforest and its rivers for generations. Cultural traditions include fishing, hunting, traditional medicine, and bush craft, but their culture, like their land, is under threat. Bordering the UNESCO World Heritage Site, La Amistad International Park (PILA), which Panama co-manages with Costa Rica, Naso territory is also of ecological importance. In January, UNESCO sent a monitoring mission to PILA to assess various threats to the park, such as ongoing dam development and potential hydroelectric projects. One of the comments in the mission report focused on the immense social impact that dams are having upon communities like the Naso. Promises of a comarca have been made often but never fulfilled. * Jennifer is a freelance journalist writing about human rights, hydroelectric development, the extractive industries and corporate malfeasance in Latin America, Africa and the UK.